The theme is clear when you look at the title: Resident Evil. What it actually is is the gigantic mansion of Resident Evil (1) for those who dont know: this is horror adventure type playstation game. The textures are taken from the game and the official max payne texture pack and some are self-made. The map concept is only very few ammo and weapons in a huge map and you begin with your crowbar only. The items are all placed as they were in the playstation game. You start with a small intro where you see the outside of the mansion and you get the message "you could escape into the mansion where you felt save, but..." or somethin. Then inside the mansion you need to search your weapons and ammunition - it's a pretty good advantage if you have a glock and your enemy doesnt! I've included two sounds in the zip file one is the tic-tac of the clock in that big dining room and the other sound is a combination of the background music files - I took the best music of the mansion area and made one sound out of them so that all the music will played one after another. The sound and visuals make the map real scary, sometimes you really get a shock when you see the enemy or hear a shot. HL_resident_evil is huge - there are two big rooms, one is the main hall and the other the dining room and a lot of corridors and other rooms. If you dont know Resident Evil you might get lost and dont find the weapons or ammo. The two big rooms are seperated from the rest of the map through brushes and the doors work like teleporters, because the r_speeds were too high the common way. Since the map is very big you should at least have four people playing it who know Resident Evil or the map. The only weapons in this map are glock, shotgun, colt, machine gun and handgrenades - I really like the alternative gameplay and the atmosphere. 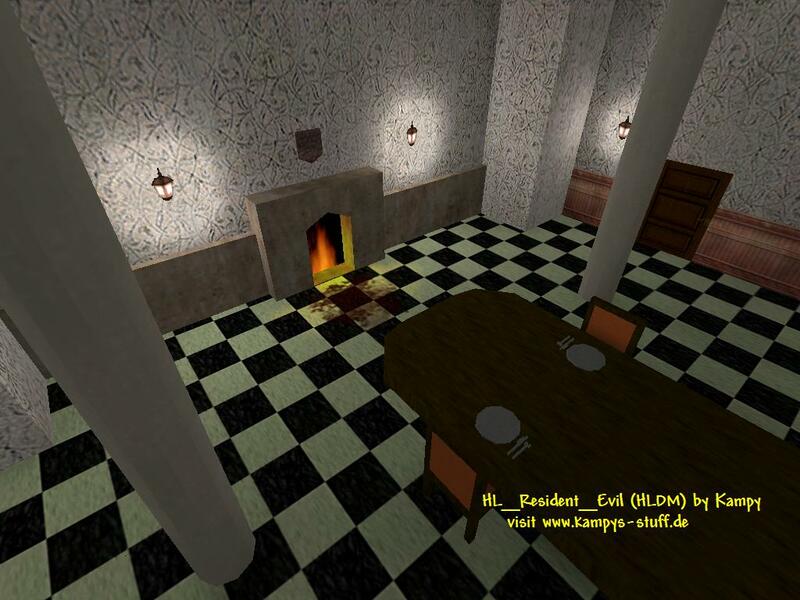 This map is a remake of my very old Counter-Strike map de_resident_evil or actually it's the map that I wanted to make when I began with the map which became de_resident_evil later. HL_resident_evil is a map with a great atmosphere and special gameplay and I recommend this to all Resident Evil fans and to players who like big scary maps or want a total gameplay change from what it's normally. - weapons are placed like in the playstation game R.E. - the doors in the 2 big rooms are teleporters, dont wait at the teleport destination point too long or another player could spawn into you. 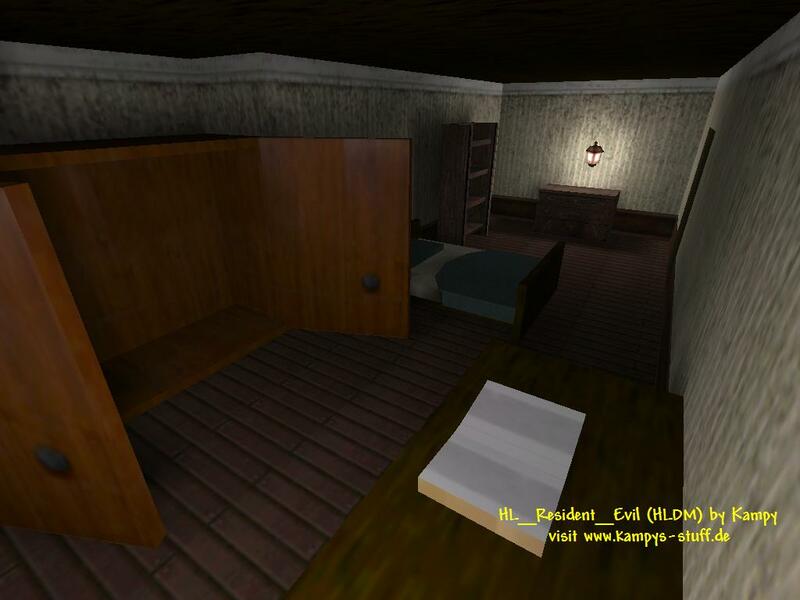 - items and weapons are placed like in Resident Evil. 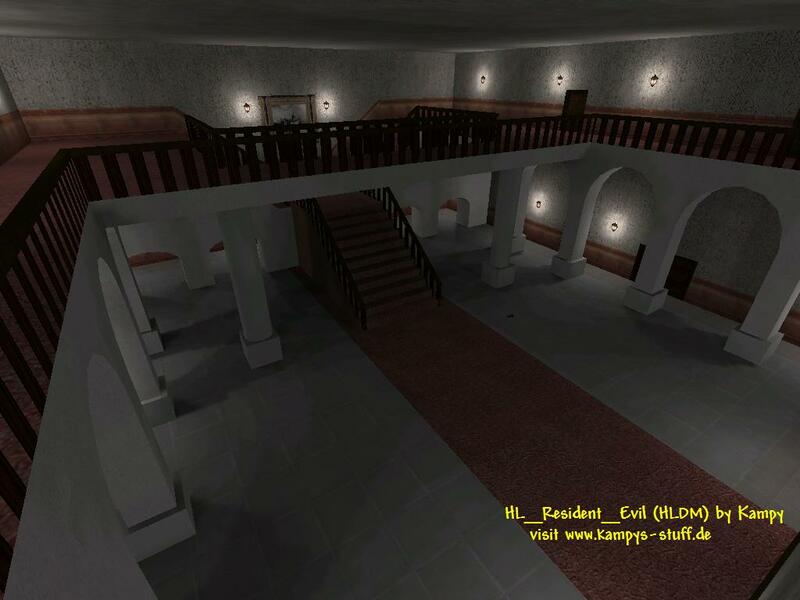 - This map exists as a cs map: "de_resident_evil_V2" the original de_resident_evil is not changed from the gameplay so download the second version if you dont know which you should take.